In addition to thousands of products and special offers from leading brands, the new Screwfix catalogue also features great deals on everyday essentials, offered at everyday low prices. By understanding the products regularly used by their customers, Screwfix are supporting busy trades people and serious DIYers by keeping prices low. Trusted by the trade for 40 years, Screwfix have highlighted these special deals in their latest catalogue, online and instore, using the Low-Price badge below. 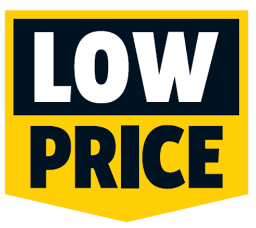 These special prices offer great value for money and range from bathroom and plumbing products through to electrical, painting and decorating, security, landscaping and power tools. Everything ordered through the catalogue is available for next day delivery seven days a week, or via Screwfix’s Click & Collect service at one of 620 stores in as little as one minute. Perfect for electrical installations, this main switch is of corrosion-resistant Zintec steel construction. With multiple extra-large knockouts for easy installation. Smart and modern in design, it looks good even in visible installations. Its top hinged door prevents door being left open after use, reducing possible fire risk. Continual earthing through casing and door, only need to earth once via base. You can never have enough frogtape- this low tack masking tape is specifically designed for a crisp, sharp line on delicate surfaces, such as freshly painted or plastered walls, wallpaper, treated wood and emulsion paint. UV resistant. Can be applied up to 60 days before you paint. Razor-sharp triple-ground teeth for cutting all materials. Cuts on the push and pull. Water-based lacquer gives up to 4 times more rust protection. Comfortable handle for prolonged use. Wet and dry vacuum with heavy-duty stainless-steel tank, tank drain, synchro feature and onboard tool storage. The high-performance motor provides superior cleaning power.